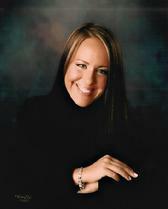 Sherry has had over 14 years experience in the beauty industry. You may know her, as she is a Barrington native, as well as one of Chicago‟s most renowned makeup artists. She started her career by graduating from modeling school, then continued on to Columbia College in Chicago to study numerous aspects of makeup including corrective, theatrical, old age, camouflage, and blood & gore. Then went on to study with one of the world's top makeup artist, "Eyebrow Guru", and founder of Tr�cco Cosmetics by Sebastian and Senna Cosmetics, Eugenia Weston. Sherry presently is the National Makeup artist for Senna Cosmetics, and is also a Celebrity Makeup Artist (she has worked with A-list actors who have starred in movies and/or TV Shows such as Saved by the Bell, Showgirls, The First Wives Club, Dazed and Confused, The Sweetest Thing, The L word. She has also worked with musicians/directors/radio personalities/well known politicians, done work for celebrities for various news outlets such as WGN, FOX News 'International'/ CNN, and various Miss Illinois and Miss Teen Illinois. Various news outlets and reporters regularly seek her out for her opinions on new makeup colors, trends and techniques. Her other achievements have been as a volunteer as a teacher at beauty colleges and esthetics school to teach the makeup portion of their courses for free as well as voluntary participate in college career days as master speaker. She is also a big advocate of breast cancer awareness and has done free lectures through local hospitals; teaching women with breast cancer how to choose and apply the right natural looking eyelashes and sculpt brows with patented eye brow kits with stencils with 'form a brow,' patented by Senna Cosmetics. ©2011 Aura Studios, Inc. All rights reserved.